Google's coping with the New Year better that Microsoft's Zune did. Phew. In particular I was curious to see how well dates in the onebox coped with the new date - and they all do well (most of them don't mention the year anyway). A search for the Chinese New Year is the weakest result. It's not wrong. It's just old. It's about a year old at this point. 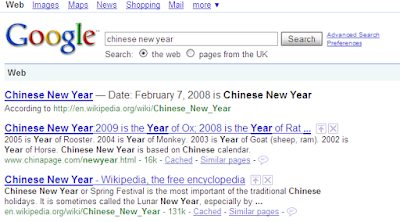 Google's onebox still serves up when the 2008 Chinese New Year was. I would say a week after that date the onebox would have been better used to tell me when the 2009 New Year is (Jan 26th; the Year of the Ox). It certainly makes me wonder when this onebox result will update. Anyone want to bet that it'll update after the 2009 Chinese New Year?